Our company was purchased by another entity recently and the new owner’s fiscal year goes from July to June instead of Jan-Dec as we have historically always used. When we closed our 2018 Fiscal Year at the end of December, we created the 6 periods of the “new” fiscal calendar that were left that would end in June 2019. They “technically” would be periods 7-12 of 2019 with the new owner’s fiscal calendar but we created them as 1-6. Since the new 2020 fiscal year will start in July, what would be the proper way to close the 2019 fiscal year? We’ve already found that some of our financial reports do not work right unless there is a full 12 period fiscal calendar year setup and we don’t have that for fiscal year 2019 at the moment. Can we close fiscal year 2019 with just 6 periods currently setup? If so, are there any repercussions to doing that? Should we maybe create periods 7-12 as possibly “1” day periods in June and shorten period 6’s dates? We are kind of at a loss here on what would be the right way to accomplish this and not mess anything up. Any help would be greatly appreciated. 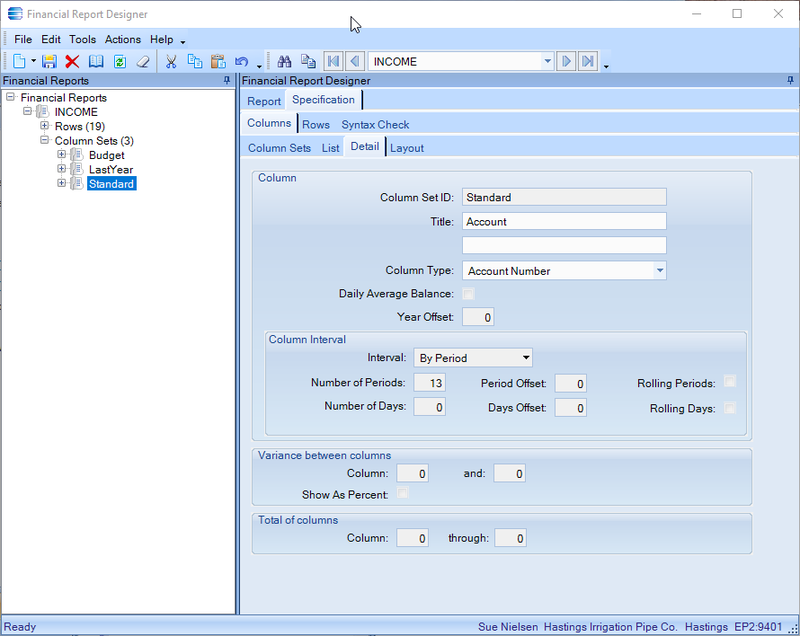 If you use Epicor’s financial report designer you can manipulate the reports to use 6 periods. We have odd looking fiscal years due to “newbie errors” when we went live in Vantage and conversion issues from Vantage to E9. 2001 has 1 fiscal period 9/1 - 12/31. 2002-2005 have 1 fiscal period 01/01 - 12/31. 2006 has 2 fiscal periods 1/1 - 12/30 & 12/31 - 12/31. 2007 and after have 12 “normal” fiscal periods. If you won’t be using the 2019 fiscal calendar after 06/30/2019 you could set period 6 at 6/1/2019 - 12/31/2019 or just stop at 6/30/2019. Thanks so much Sue. So, if we close Fiscal Year 2019 on June 30 with just 6 periods created and start Fiscal Year 2020 on July 1 and create the correct 12 periods from July 1, 2019 to June 30,2020 , Epicor should let us do that and we can move on from there as normal?